В январе 1918-го первым вышел на испытания образец с ротативным "Гномом моносупапом". Испытания машин со стационарными моторами начались в мае. Самолет с ротативным двигателем ничем не выделялся на фоне иных машин своего класса, зато прототип с "Уоспом" благодаря повышенной энерговооруженности показал гораздо более высокие летные характеристики. Однако это в значительной мере компенсировалось низкой надежностью и частыми отказами еще "сырого" и недоведенного мотора. Тем не менее военное министерство заказало 12 серийных экземпляров машины с "УОСПОМ". получивших обозначение FK.23 и наименование "Бэнтэм". От FK.22 они отличались слегка увеличенным размахом крыльев, уменьшенным килем и расширенным рулем поворота, а также установкой вооружения - двух синхронных пулеметов "Виккерс", закрепленных внизу передней части фюзеляжа, перед кабиной. Линии огня проходили между двумя нижними цилиндрами двигателя. Первый серийный экземпляр поднялся в воздух 23 июля 1918 г. Всего было построено 9 "Бэнтэмов", причем последний из них оснастили новым 200-сильным мотором "Уосп II". С такими же двигателями планировалось выпустить и три оставшихся экземпляра военного заказа, но "Уосп II" оказался настолько ненадежным, что от их постройки отказались. Один из "Бэнтэмов" для ознакомления отправили во Францию, еще один - в США. Дальнейших заказов на FK.23 не последовало, и на фронт эта машина так и не попала. Однако она стала первым в мире серийным истребителем со стационарным радиальным двигателем, получившим в дальнейшем широкое распространение. The first prototype F.K.23 was originally ordered as the fourth of a batch of six development F.K.22s, and while retaining the wooden structure with monocoque fuselage, it embodied extensive redesign. Overall span and wing area were reduced to 20 ft (6,09 m) and 160 sq ft (14,86 m2) respectively, and the tail surfaces were redesigned. Armament comprised two synchronised 0.303-in (7,7-mm) Vickers guns and power was provided by a 170 hp A.B.C. Wasp I, flight testing being initiated in May 1918. 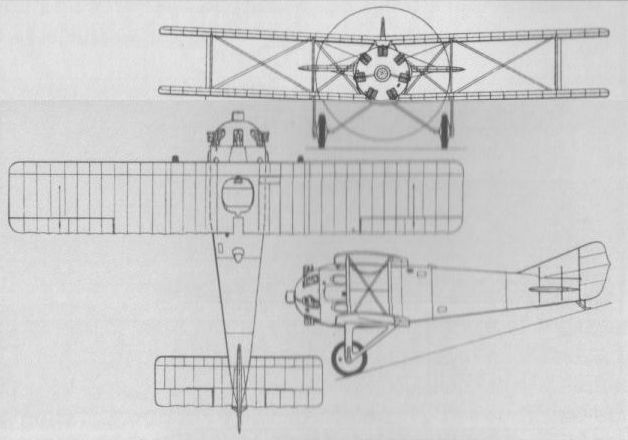 Two further prototypes (originally ordered as the fifth and sixth F.K.22s) were similarly powered, but dimensionally larger, and after further redesign resulting from initial flight trials, a batch of 12 F.K.23 Bantam Is was ordered, the first of these being delivered to the RAE at Farnborough on 26 July 1918. At least nine Bantam Is were completed, one of these being sent to France and evaluated at Villacoublay in the late summer of 1918. One example was sent to the USA for evaluation at Wright Field, but this fighter's principal shortcoming was the poor reliability of its Wasp I engine. Max speed, 128 mph (206 km/h) at 6,500 ft (1 980 m). Time to 10,000 ft (3050 m), 9.0 min. Empty weight, 833 lb (378 kg). Loaded weight, 1,321 lb (599 kg). Span, 25 ft 0 in (7,62 m). Length, 18 ft 5 in (5,61m). Height, 6 ft 9 in (2,06 m). Wing area, 185 sq ft (17,18 m2). ALTHOUGH not, perhaps, possessing the interest of novelty, having been designed a matter of nearly two years ago, the B.A.T. Bantam nevertheless presents many features that are worthy of mention, somuch the more so as we have been prevented, during the War, from describing this machine. Its detail features will not, therefore, be so well known to a large proportion of FLIGHT readers as they deserve to be, and consequently we trust that the following descriptive article may be found of interest. Mr. F. Koolhoven, the designer of the B.A.T. machines, was, as is well known, chief designer to Messrs. Armstrong, Whitworth and Co. for a considerable time, and produced, while with that firm, some very successful machines of widely differing types. 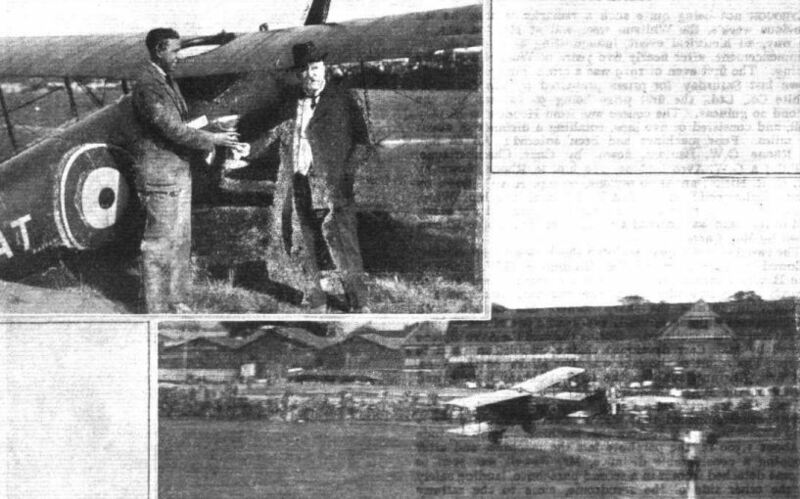 Previous to that, Mr. Koolhoven was associated with the British Deperdussin Co. at their works at Highgate, where, in the years before the War, some very successful monoplanes were produced. Among these was, it may be remembered, a monoplane seaplane, the "Seagull," which, among other features, was remarkable for the monocoque construction of its body, a form of construction not often seen in this country in those days. The body structure was found to be remarkably strong and light, while possessing an excellent stream-line form. It is not, therefore, surprising to find that Mr. Koolhoven, having been successful with monocoque construction so long ago, still favours this method in his later machines, such as the Bantam and Basilisk. The detail construction has been somewhat changed, and, perhaps, one may not, strictly speaking, be justified in using the word monocoque in its usually accepted sense. However, in so far as having no internal bracing, except that provided by the fuselage covering, the B.A.T. Bantam, and also the Basilisk, may be said to have as one of its most noteworthy features a fuselage construction akin to the monocoque. In the B.A.T. Bantam the fuselage construction consists essentially of a light framework, comprising six longitudinal members and a number of transverse formers built up of three-ply wood, the whole covered by a three-ply skin put on in bands some 3 ft. wide, lap-jointed where they meet. The outer and inner layers of this three-ply skin run longitudinally, while the middle layer is placed at an angle to the other two. The longitudinal members are of ash, and are placed as follows: one at the top, one at the bottom, and the other four forming the corners of the rectangle inscribed in the elliptical cross section of the body. The top and bottom longerons are of T section, while the other four are rectangular. Where the transverse formers are attached to the longerons the formers are reinforced for extra strength. The formers themselves are of L section, the ash base of the L lying against the fuselage covering. In section, the body of the Bantam changes from circular in front, through elliptical to narrow ellipse and vertical knife's edge at the stern. From a resistance point of view the shape would appear to be excellent. At the rear the three-ply body covering is extended upwards to form the fixed vertical tail fin, the internal framework of which is integral with the body formers in this locality. The fixed tail plane is in two halves bolted to short spar roots built integral with the formers. A peculiarity of this design, which is somewhat similar to that of the Dep. "Seagull," is that the elevators do not go right up to the sides of the body, the space between the inner ends of the elevator flaps and the sides of the fuselage being occupied by a fixed portion of the tail plane. This will be clear from the plan view of the general arrangement drawings. As in the old Dep. monoplane, the elevator crank levers are housed inside the ply-wood fin, giving a very neat and clean appearance to the tail plane. The rudder is fabric-covered, as is also the tail plane and elevator, and forms, at its lower corner, a housing for the shock-absorbing spring of the tail skid. This skid turns with the rudder, but is so designed that, although superficially appearing to do so it does not transmit shocks to the tubular leading edge of the rudder, but to the fixed rudder post. 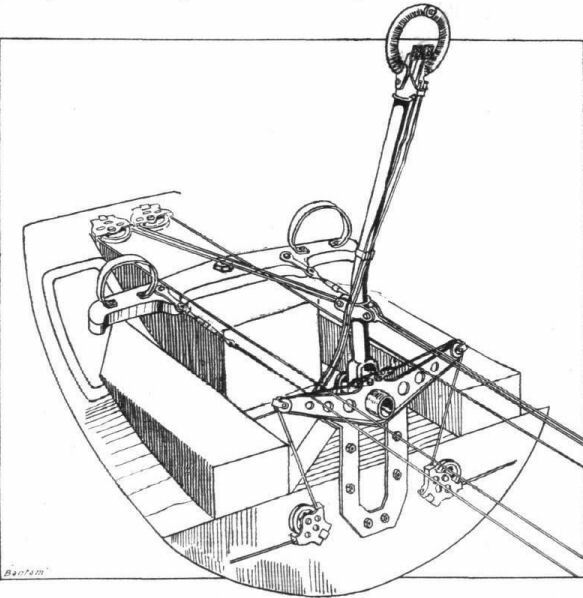 For steering at low speeds on the ground, this arrangement is excellent, as the skid is capable of turning the machine at speeds so low that the rudder has not yet become operative. At the same time it would be difficult to imagine anything simpler or offering less resistance. As the angle of incidence of the tail plane of the Bantam is not made adjustable, the bracing of the tail consists simply of eight R.A.F. wires, four above and four below the tail plane. The pilot's cockpit is situated between two strong formers, serving as supports for the wing spars, and access to it is gained through a circular opening in the top plane. When the pilot is in his seat his eyes are about on a level with the spars of the top plane, and he therefore has a very good view in all directions except straight down, where the bottom plane obstructs the view to some extent, although no more so than on machines in which the pilot is less favourably situated as regards the top plane. The controls are of more or less usual type, consisting of a central control column terminating at the top in the standard handle, and of a foot bar for the rudder. The manner in which the controls work will be clear from the accompanying sketches. Although the fuselage of the Bantam is not of exceptionally great cross section, the pilot's cockpit is very roomy, this being one of the many advantages of the monocoque construction, which does not waste space on internal girders and bracing. Mounted on a flat sheet steel capping plate over the extreme nose of the fuselage - the main structure of which is rectangular at this point, although made up to a circular section by the surrounding cowl - is the 170 h.p. A.B.C. "Wasp" engine. Slots in the cowling admit air to the cylinders, and the air escapes at the engine plate through various passages cut in the cowl. In so doing the air is forced to negotiate some rather sharp bends, which have, however, been avoided in a later type (the Basilisk), in which the air, after passing each cylinder, is allowed to escape via cone-shaped cavities in the engine cowling. The oil tank is mounted immediately behind the engine, while the main petrol tank, which has a capacity of 22 1/2 galls., is accommodated in the fuselage behind the pilot's cockpit. With regard to the wings, these are mainly remarkable for a somewhat low gap-chord ratio. This is a consequence of the placing of the pilot so that his eyes shall be on a level with the top plane, in order to obstruct to as small extent as possible the view. It is not, we know, usual to consider the gap-span ratio of an aeroplane, although, to our way of thinking, this ratio may easily be of as great importance structurally as is the gap-chord ratio aerodynamically. Thus, in a very high aspect ratio wing structure the gap-chord ratio may be the normal (about 1), but the gap-span ratio very low. The result of this will necessarily mean a less favourable angle of the lift wires. This in turn will have its effect upon the number of struts which it is efficient to employ. Thus, in the B.A.T. Bantam, although the span is low, the small gap results in a low gap-span ratio, and it will be seen that if only one pair of struts was employed on each side, the angle of the lift wires would have been very flat. It was further desired to provide a wide wheel track which would ensure that the machine could not easily be overturned when doing sharp turns on the ground, and with the steerable tail skid this machine is capable of some very sharp turns at speeds which, although below the flying speed, are quite high enough to be dangerous with a narrow track undercarriage. The designer then made the bold step of securing both these desiderata by a radical departure from usual practice. This took the form of fitting two pairs of inter-plane struts on each side and attaching the undercarriage struts to the spars at the point where occur the inner pair of inter-plane struts. In this manner, not only was a good angle provided for the lift wires, and the free length of wing spars reduced, but the resulting track of the landing wheels was so wide as to practically exclude any possibility of turning over. There was, in the earlier days of flying, a prejudice against attaching the undercarriage to the wings instead of to the fuselage, the argument being that landing shocks might seriously strain the wing structure without this being apparent until the machine was taken for a subsequent flight. In the B.A.T., however, one has a very light machine and a very sturdy wing structure, so that this objection - which is probably a rather theoretical one, after all - need not cause any misgivings. We have never heard of any ill effects arising out of this feature of its design during the two years or so of the machine's existence. As regards the wing structure of the Bantam, this is designed along orthodox lines. The inter-plane struts, which are of elliptic cross-section steel tubes, are attached to the wing spars by a very neat and simple socket, and are held in place by a small split-pin. 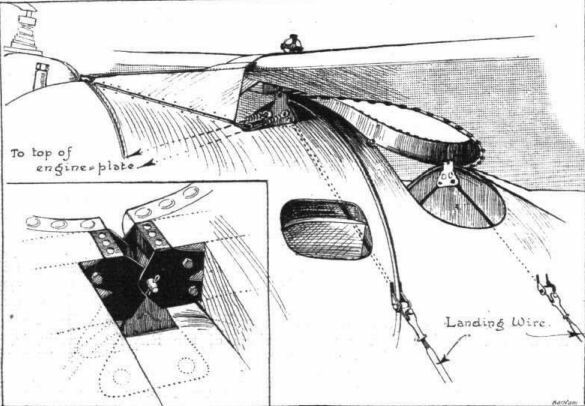 The manner of attaching the base plate of the socket to the wing spar is shown in one of the accompanying sketches. The wing bracing is effected by 1/4-in. B.S.F. R.A.F. wire, the lift and landing wires in the outer bay, and the landing wires in the inner bay being single. The lift wires in the inner bay are in duplicate, so as to withstand better not only the flying loads, but also the loads imposed upon the wing structure while landing. In order to minimize vibration and prevent the wires from twisting under the force of the wind a neat arrangement is provided at the points where lift wires and landing wires cross one another. In the outer bay this takes the form of a long tube, slotted at its ends to accommodate the crossed wires, which are locked in position by an "acorn" and a collar with a split-pin, as shown in one of our sketches. In the inner bay where, as already mentioned, the lift wires are in duplicate, two short tubes are employed, one for each three crossed wires, as shown in the sketch. 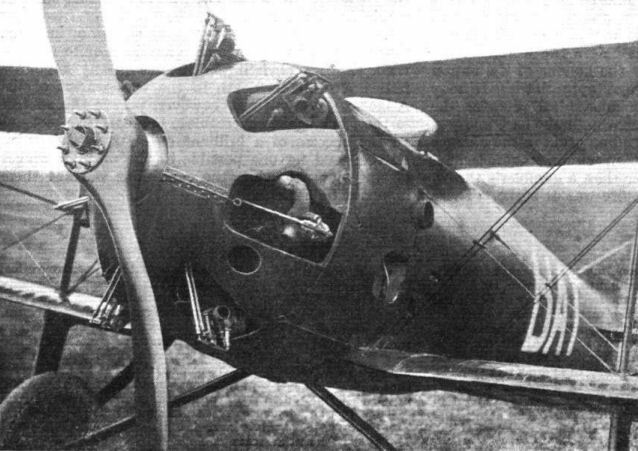 The lower planes are attached to short wing roots built into the body integral with two very strong formers - one in front of the pilot's cockpit and one behind it. 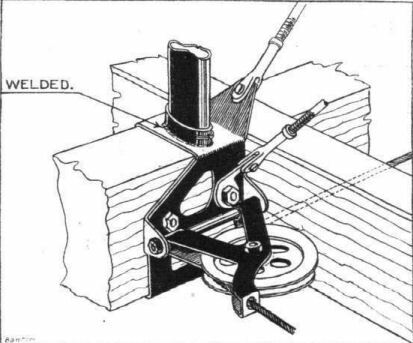 The two halves of the top plane are bolted to the apex of the same two formers, the detail of this attachment being shown in one of the sketches. The landing wires of the inner bay are attached to lugs on the side of the fuselage, these lugs being further braced from the top of the formers by means of long sheet steel strips in the manner indicated in one of our diagrams. In this way the rigging of these landing wires is greatly facilitated, while the steel strips transmit the load to the top of the formers. As already mentioned, the top plane has cut in it a circular hole, through which the pilot enters the machine, and by means of which he obtains a very good view in all but a downward direction. Ailerons are fitted to all four wings, and are operated in the usual way. 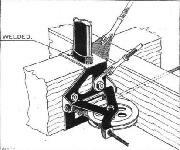 The return cable is passed inside the top plane, and is exposed for a short distance at the front edge of the hole in the top plane. The undercarriage of the B.A.T. Bantam is, as already pointed out, of unusual design. The two strut Vees are attached, not to the fuselage, as is usual practice, but to the lower wing spars at the points where occur the inner pair of inter-plane struts. Each half of the divided axle is hinged to the body, and bent just before crossing the slot in the V struts. These are built up of multi-ply wood and bound with fabric, while the axles are circular section steel tubes, stream-lined with a hollow fairing of wood bound with fabric. A notable feature of this undercarriage is the absence of wire bracing of the two Vs. The function of bracing is performed by the axles, which really act as lateral radius rods for the Vs.
On each side of the struts there is mounted on the axle a steel quadrant which serves the double purpose of housing the rubber cords and acting as guides limiting the lateral shifting of the Vs. The whole makes a very neat and simple job, offering small resistance, and yet being quite strong. Whether this arrangement would be advisable in a large machine is, perhaps, open to discussion, but for a small, light machine like the Bantam it certainly would be difficult to improve upon. The following particulars of performance, etc. should be of interest :- Weight of machine loaded, 1,335 lbs. Range, 425 miles. Speed near ground, 138 m.p.h. ; at 10,000 ft., 134 m.p.h. ; at 15,000 ft., 127 m.p.h. Climb to 10,000 ft., 7.2 mins. ; to 15,000 ft., 14 mins. Ceiling, 25,000 ft.; landing speed, 50 m.p.h. ; load/sq. ft., 7.2 lbs. ; load/h.p., 7.85 lbs. ; military load, 520 lbs. 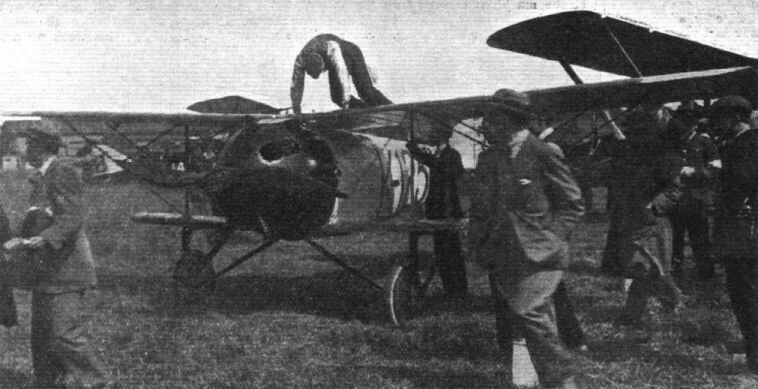 This machine, which was piloted by Mr. Clifford B. Prodger, is the standard Bantam. It has a monocoque body of excellent streamline shape, and is chiefly remarkable on account of the placing of the top plane low over the body and with no stagger in relation to the bottom plane. Also the undercarriage struts are attached to the bottom plane instead of, as is more usual, to the body direct. This placing of the chassis has the advantage of giving a very wide wheel track. The pilot is placed in a circular opening cut in the top plane, where his eyes are on a level with the plane. The view is, therefore, exceptionally good in all directions except straight down, where the bottom plane obstructs it to a certain, although small, extent. The machine is very fast, climbs well, and is manoeuvrable to a remarkable extent. With the exception of the short bottom plane, and consequent difference in strutting, this machine is a standard Bantam, similar to No. 1. It was flown by Maj. Draper, who was to have flown the little new B.A.T. sporting two-seater, the F.K. 27. This machine, however, was not finished in time and hence Maj. Draper flew No. 3. This fact deprived Capt. Vaughan of a mount, and as the B.A.T. five-seater, F.K. 26, was slightly damaged on Saturday morning, she 'was not able to start in the race, and thus another B.A.T. pilot, Lieut. Turner, was without a machine when the race started. The fifth aircraft from the production batch of Bantam Is built in 1918, in racing trim. The F.K.23 Bantam in its final form with A.B.C. Wasp engine, photographed on 31 August 1918. Истребитель "Бэнтэм" со стационарным мотором ABC "Уосп" / Side View of the B.A.T. "Bantam" (A.B.C. 200 h.p. "Wasp" engine). 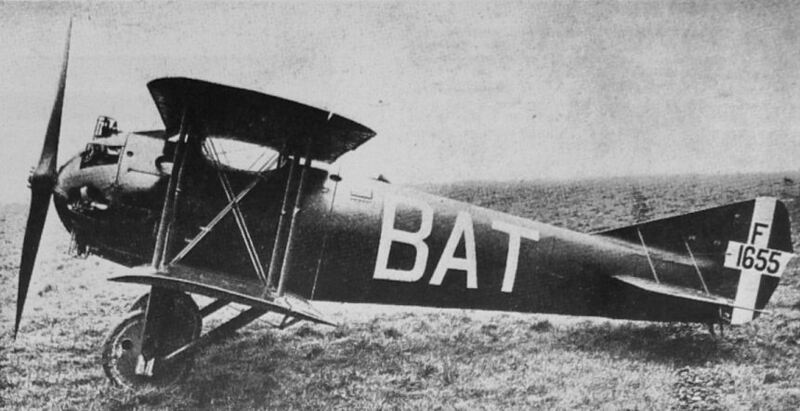 This BAT FK 23 Bantam, serial no F 1655, the third of nine production aircraft completed, proclaims its British Aerial Transport parentage in bold white lettering down its fuselage in place of the normal roundel, indicating that this photograph dates from after the war and that this was one of the machines sold as war surplus in 1919. 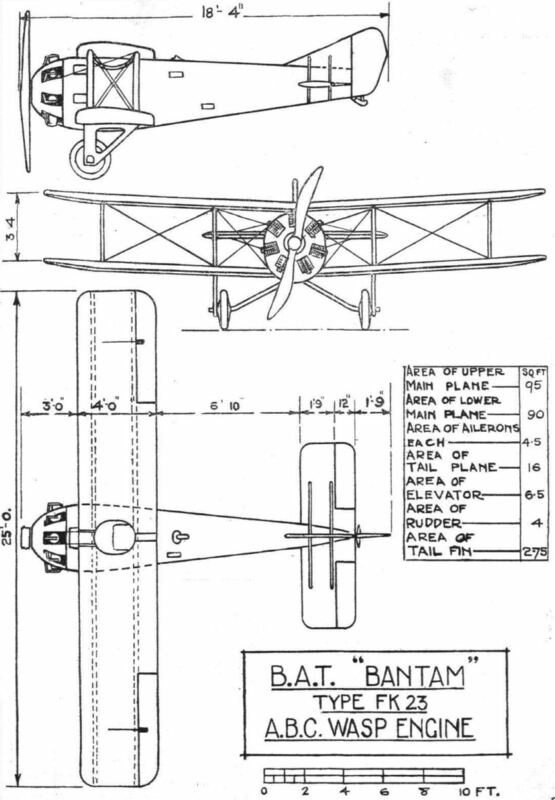 The history of the Bantam is convoluted and starts in mid-1917 when Frederick Koolhoven left Armstrong Whitworth to join the newly formed Willesden-based BAT, taking his tell-tale FK design numbers with him. At BAT Koolhoven's first task centred on designing a company-funded single seat fighter venture, designated FK 22. First flown in the early autumn of 1917 this machine gained Air Board interest and a contract for six examples followed. Originally planned to use a 120hp ABC Mosquito radial, one of the four FK 22s known to have been built and flown during 1918 used a 100 hp Gnome Monosoupape, subsequently replaced by a 110hp Le Rhone 9J rotary. To compound matters, virtually all of the FK 22s varied in airframe detail, but out of this melee emerged the 170hp ABC Wasp powered example in the spring of 1918, the change being considered great enough to warrant the new designation of FK 23 Bantam. Others of the original FK 22 were re-engined with the Wasp, but all of these machines were criticised for the ease with which they would enter a vicious, flat or autorotative spin. To cure this problem, the later nine so-called production aircraft incorporated a modified set of increased span wings and tail unit. The later FK 23s that initially appeared in October 1918 had the by now standard twin Vickers guns, along with a top level speed of 128mph at 6,500 feet, falling to 118mph at 18,000 feet. Time to reach 10.000 feet took 9 minutes. Time, however, was about to run out on the Bantam with the coming of the Armistice. "The Bat," designed by Mr. Frederick Koolhoven, and tested by Mr. Peter Legh, climbing 20,000 ft. in 21 min. When aerial police get going, the "Bat" will, no doubt, be a scout which aerial lawbreakers will have to reckon with. K-123, the B.A.T. F.K.23 Bantam flown by C. B. Prodger on 21 June, 1919, in the Victory Aerial Derby. The engine is a 170 h.p. A.B.C. Wasp. No. 3. - The B.A.T. Bantam, 170 h.p. A.B.C. Wasp, flown by Maj. C. Draper. This machine is the standard Bantam, except that its bottom plane has been cut down in size. THE AERIAL WELCOME. - Mr. Clifford Prodger, on a B.A.T. Bantam, flew over Paddington on Sunday when the commander and crew of N.C. 4 arrived from Plymouth. 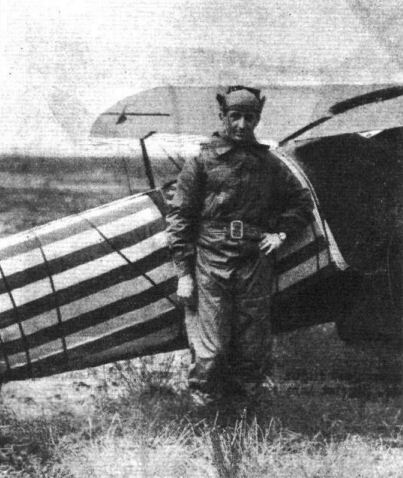 Note the American flag on the fuselage. The A.B.C. Wasp-engined B.A.T. F.K.23 Bantam I.